The Cover: This cover- I am in love with it! 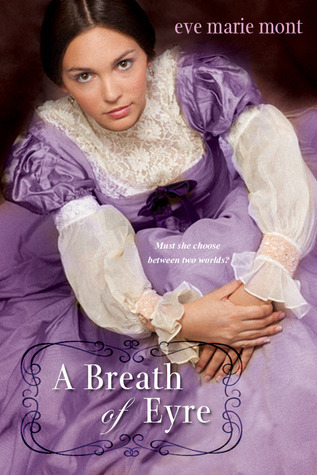 I was following the progress of A Breath of Eyre long before the book had it's cover and I am so completely happy and satisfied with how the cover came out. I love the dress (and that it is actually in the story). The color, the font, and the model really fit the feel of Jane Eyre (but a modern take). The Characters: Emma confused me at first. I wanted to like her, but I felt a bit that she was being selfish. She still seemed to be grieving her mother and having a broken relationship with her father only made Emma feel more alone. I enjoyed seeing Emma as Jane- I really enjoyed it when Emma started changing the story of Jane Eyre while she was living in it. And Gray... boy you are a "hot mess." I hope book two bring Gray a few happier days. One last mention- Mr. Gallagher.... have you ever watched "To Catch a Predator"? No? You need to. The Story: I thought the author did an amazing job working Emma's time between Thornfield and real life together well. I enjoyed getting to see who from Emma's "real life" would play characters in her time in the Jane Eyre story (and I was right on a few of my guesses!) What I really loved about this story was that somehow Eve Marie Mont reworked the Jane Eyre story and made it completely new and completely different. I have read Jane Eyre countless times and I have learned so much more about the story and myself by reading "A Breath of Eyre". The author has made one of my favorite classics even better by writing this novel. I should note though, that while there are two passionate romances, mystery, intrigue, and broken relationships, this story really centers around Emma and her need to find wholeness again after the loss of her mother and her father emotionally. This story was incredibly satisfying and I can't wait to read the next book in this series! I also fell in love with the cover. I won a copy and can't wait for it to get here! I love the cover for this one too although it does make me think of a straight historical instead of incorporating Jane Eyre into the book.